British rock singer, songwriter, and guitarist. Born: 25 May 1958 in Sheerwater (Near Woking), Surrey, England, UK. English singer, songwriter, and previous leader of two bands: The Jam and The Style Council. In England, he is recognised as something of a national institution yet, because much of his songwriting is rooted in English culture, he has remained essentially a national rather than an international star. He was a central figure in the Mod revival. As the leader of The Jam he fronted the most popular British band of the punk era, influencing legions of English rockers that ranged from his mod-revival contemporaries to Smiths in the 1980s and Oasis (2) in the 1990s. During the final days of The Jam he developed a fascination with Motown and soul music, which led him to form the sophisti-pop group Style Council in 1983. 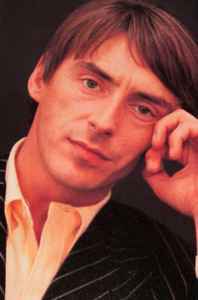 As The Style Council’s career progressed, Weller’s interest in soul moved towards an infatuation with jazz-pop and house music, which led to the gradual erosion of his audience and the eventual split of The Style Council in 1990. But by then, Weller couldn’t get a record contract in the UK, where he had previously been worshipped. As a solo artist, Weller returned to soul music as an inspiration, cutting it with the progressive, hippie tendencies of Traffic. Weller’s solo records were more organic and rootsy than the Style Council, which helped him regain his popularity within Britain. He launched his solo career in 1992 and by the mid 1990s, he had released three successful albums which were both critically acclaimed and massively popular in England. Then contemporary bands like Ocean Colour Scene were citing him as an influence. Just as importantly, many observers, while occasionally criticising the trad-rock nature of his music, acknowledged that Weller was one of the few rock veterans that had managed to stay vital within the second decade of his career. Son of John Weller (2). He married Dee C. Lee in 1987; divorced in 1988. Father of Leah Weller (with Dee C. Lee). He became involved with Samantha Stocks until 2008. He married Hannah Andrews in September 2010. Paul Weller "Live From Victoria Park"